PRESORTED STANDARD U.S. POSTAGE PAIDThe Jewish Press Group of Tampa Bay, Inc.The Jewish Press Group of Tampa Bay, Inc. Jewish Press of Pinellas County P. O. Box 6970 Clearwater, FL 33758-6970KNOW continued on PAGE 15ADVERTISEMENT www.jewishpresspinellas.com VOL. 32, NO. 17 ST. PETERSBURG, FLORIDA MARCH 23 APRIL 5, 2018 20 PAGES See inside for details. WIN SHOW TICKETS Jewish Press Online Ticket Contest WIN SHOW TICKETS Jewish Press Online Ticket Contest Passover the Festival of FreedomFirst Seder Friday, March 30 Join our page @ www.facebook.com/jfed.pinellas Meet This Guy, Did you know?one of the featured individuals in the Humans of Tel Aviv photography exhibit that will delight at the April 15th Israel Independence Day Celebration. Whats his story? Attend to nd out! Federation Jewish Heritage Funding, matched by the State of Floridas Arts & Culture Division: $48,000. rfntb The Jewish FederationOF PINELLAS & PASCO COUNTIES, FL nntbb fnn fnf DO GOOD EVERYWHERE. FROM ANYWHERE. fIsrael turns 70 this year! A 70th anniversary is traditionally marked with gifts of platinum, known for its strength and rarity, and holding higher esteem than gold or other metals. While a number of Israeli collectible medals are minted in platinum, its not mined in Israel. Tidbits you (probably)dont know about PassoverMy Jewish Learning via JTA news service1. In Gibraltar, theres dust in the charoset. The traditional charoset is a sweet Passover paste whose texture is meant as a reminder of the mortar the enslaved Jews used to build in ancient Egypt. The name itself is related to the Hebrew word for clay. In Ashkenazi tradition, it is traditionally made from crushed nuts, apples and sweet red wine, while the tiny Jewish community of this small Peninsula takes the brick symbolism to another level, using the dust of actual bricks in their recipe. 2. Arizona Is a hub for matzah wheat. increasingly sourcing wheat for their Passover matzah from farmers in Arizona. Excessive moisture in wheat kernels can result in fermentation, rendering the harvest unsuitable for Passover use. allows for a stricter standard of matzah production. Rabbis from New York travel to Arizona in the days leading up to the harvest, where they inspect the grains meticulously to ensure they are cut at the precise moisture levels. 3. At the Seder, Persian Jews whip each other with scallions. Many of the Passover Seder rituals are intended to re-create the sensory experience of Egyptian slavery, from the eating of bitter herbs and matzah to the dipping of greenery in saltwater, which symbolizes the tears shed by the oppressed Israelites. Some Jews from Iran and Afghanistan have the tradition of whipping each other with green onions before the singing of Dayenu. 4. Karaite Jews skip the wine. Karaite Jews reject rabbinic Judaism, observing only laws detailed in the Torah. Thats why they dont drink the traditional four cups of wine at the Seder. Wine is fermented, and fermented foods are prohibited on Passover, so instead they drink fruit juice. (Mainstream Jews hold that only fermented grains are prohibited.) The Karaites also eschew Israels 70th birthday bash offers something for all It will be an afternoon of speeches, food, family fun, photographic art, music and festivities when the Pinellas/ Pasco Jewish community celebrates the 70th anniversary of the birth of Israel on Sunday, April 15 in Largo. Hosted by the Jewish Federation of Pinellas and Pasco Counties, the free celebration will be held at the Creative Pinellas/Pinewood Cultural Center, 12211 Walsingham Road, Largo, from 1 to 4 p.m. One of the featured guests will be Israeli photographer Erez Kaganovits, who will talk about an exhibit of his work, ISRAEL continued on PAGE 17 A sampling of the photographic exhibit that will be on display at the event. PAGE 4 JEWISH PRESS of PINELLAS COUNTY MARCH 23 APRIL 5, 2018 rfrfn tbfbfbbfbfbrbb nbbbbbbbbbbb rrbnbb fffbffbrfnt nbbnnbr rfrbbb rrbtr r rent-all cityinc.From Simchas to Seders Your Event HeadquartersVISIT OUR SHOWROOM7171 22nd Ave. N., St. Petersburg(just west of Tyrone Square Mall)Tables, Chairs, Linens, Chair Covers, China, Silver, Stemware, Tents, Stages, Dance Floors, Star of David Candelabras, Chuppah and much more!Serving Extended Tampa Bay Area(727) 381-3111 www.rentallcity.com Owned and operated by the Pinsker family since 1960From our family to yours Happy Passover Visit us on both sides of the Bay Shipping and Gift Wrapping Available Hyde Park Village St. Petersburg 1619 W Snow Circle Tampa, FL 33606 813.831.2111 Shabbat Candlesticks Hamsa Necklace 300 Beach Drive NE St. Petersburg, FL 33701 727.894.2111 www.shapirogallery.com You can also shop online! Former Israeli Ambassador to the U.S. Danny Ayalon will be guest speaker at a free Jewish National Fund breakfast for Israel Â on Tuesday May 1 from 9-10 a.m. at the Bryan Glazer Family JCC in Tampa. Ayalon was born in Tel Aviv in 1955, viewing himself as the product of the ingather ing of the exiles, the intersection between the Jewish Diasporas of East and West, Sephardic and of Israels reestablishment. His father came to Israel from Algeria before the War of Independence in 1948 and fought in the Golani Brigade. His mother immigrated there in 1937 from Poland, escaping the Holocaust, in which members of her extended family perished. She also fought in the War of Independence in Jerusalem and was wounded in battle. Ayalon served in Israels Foreign Service for more than 20 years, beginning in Panama, and then the UN mission in New York. He was political adviser to three different prime ministers: Ehud Barak, Benjamin Netanyahu, and Ariel Sharon. In 2002, he was named Israels ambassador in the U.S., serving in that capacity for four years. During my ambassadorial tenure, Israel-US relations increased and improved, with American support of Israel reaching an all-time high in many areas, Ayalon writes on his website. Upon retirement from the diplomatic service in 2006, he joined Nefesh BNefesh, an organization committed to revitalizing Aliyah, and the Or Movement for settlement in the Negev and the Galilee, both issues he believes should be top national priorities. Thats not but a Zionist imperative and also a moral obligation upon us and future generations, he says. In February 2009, he was elected a member of the Knesset and soon after was named deputy foreign minister, serving in the parliament until 2013. Among his many pursuits since then, Ayalon has served as a visiting professor of foreign policy at Yeshiva University. He recently founded The Truth About Israel, a attempts to delegitimize Israel and strengthen its political status and image. Chair for the breakfast program is Lynne Merriam. RSVPs are requested to jnf.org/ tampabreakfast by April 20. Dietary laws will be observed. The JCC is at 522 N. Howard Ave., Tampa.JNF breakfast to feature former Israeli Ambassador Ayalon Danny Ayalon Florida Gov. Rick Scott has signed a bill that prohibits state agencies and local governments from contracting with companies that are boycotting Israel. Scotts bill-signing ceremony Wednesday, March 21, at the Or lando Torah Academy, a Jewish day school, also allowed him to highlight the $2 million that was included in the state budget to allow such schools to harden security against terrorist and other potential attacks. Funding will be used to help provide upgrades such as video cameras, fences, bulletproof glass, alarm systems and other safety equipment. Â Last year, the state legislature approved more than $650,000 for security at Jewish day schools. The governor touted the states strong relationship with Israel in signing the anti-BDS legislation. with our ally Israel. In 2016, I was proud to sign legislation that prohibited the state, or administration, from investing in companies that boycott Israel. Today Im proud to sign HB 545, an important piece of legislation that builds on our efforts by prohibiting any state agency and local governments from contracting with companies that boycott Israel, said Scott. In 2016, Gov. Scott signed legislation that prohibits the State Board of Administration from investing in companies that boycott Israel. Gov. Scott also supported the U.S. Embassy moving from Tel Aviv to Jerusalem. In December, he led a delegation of Florida business and education leaders on a second trade mission to Israel. During the 2011 mission, Scott signed the Florida-Israel Memorandum of Understanding Agreement between Space Florida and Israel, to support research, development and aerospace and technology projects. Floridas total economic development and trading partnership with Israel exceeds $283 million a year.Students from the Orlando Torah Academy look on as Gov. Rick Scott signs a bill that prohibits public entities from dealing with companies that boycott Israel. Scott signs pro-Israel bill; touts $2m in budget for Day School securityCorrectionCongregation Beth Am in Tampa is sending 11 teens and three chaperones to the March for Our Lives in Washington. D.C. on March 24. Temple Bnai in Clear water is sending eight teens and three chaperones; Temple Beth-El in St. Petersburg is sending four teens and two chaperones and Temple Ahavat Shalom in Palm Harbor is sending one teen. A story in the March 9 issue of the Jewish Press contained incorrect numbers for how many people were going to the march from each congregation. Temple Bnai Israel ClearwaterPassover Yizkor: On Friday, April 6 at 10:30 a.m. there will be a memorial service in the temple chapel in conjunction with Temple Beth-El in St. Petersburg. Tot Shabbat: Bring the little ones for a special Shabbat service that is tailored for the children on Saturday, April 7, from 10-11 a.m. Cinema Caf: Take in a movie on Sunday, April 8 at 1 p.m. at the temple. Turn Left at the End of the World on the Moroccan and Indian communities in Israel through a funny and heartwarming coming of age story, will be shown. Popcorn and non-alcoholic beverages are provided. There is no charge for members and friends. Theater excursion: The Adults at Leisure group will visit the Francis Wilson Playhouse on Sunday April 8 at 2 p.m. to see the comedy Once in a Lifetime Tickets are $26. Call the theater at (727) 446-1360 to reserve your seats. For more information call Linda Goldman at (727) 536-7076. Trivia Night: Tickets are on sale for Trivia Night on Saturday, April 21 at 5:30 p.m. The cost is $36 for adults and $18 for kids. Tickets include dinner and two drinks. Bible study: Explore the Second Book of Samuel and discover a unique period of Jewish history. Rabbi Daniel Treiser leads the classes on Wednesdays from 7-8 p.m. There is no fee for members; $30 for non-members for the year. Adult playtime: Play mah jongg, Mexican Train Dominoes or Bridge on Thursdays at 1 p.m. Join active seniors and play the game of your choice. Coffee and cake is served. For more information, contact Linda White at linda33217@gmail.com or (727) 688-0626. Sunday funday: Preschoolers and their parents can enjoy playtime on Sunday, April 29 from 10:30 a.m. to 12:30 p.m. when the children can meet one another and engage in fun activities. for full schedule and pricing information at (727) 531-5829.Cong. Beth Shalom ClearwaterUnited Faiths Walk of Peace: Everyone is invited to walk, talk, connect, and strive for peace on Sunday, April 8 at 2 p.m. Meet at John R. Lawrence Pioneer Park, 400 Main St., Dunedin, and walk together for about 2 miles through on peace from a variety of faith leaders. The rabbis from Congregation Beth Shalom will be participating. For more information, go to www. UnitedFaithsWalkofPeace.org. Couple to be honored: A youth scholarship Shabbat honoring Dr. Avery and Claire Stiglitz, will be held on Saturday, April 14 at 9 a.m. Movie time: Join Jews from across the globe When the Smoke Clears, which shows how a group of wounded Israeli solIsraeli organization JerusalemU, will be shown on Wednesday, April 18 at 7 p.m. at the synagogue. Happy Birthday, Israel: A musical Shabbat is planned for Friday, April 20 at 6:30 p.m. to celebrate Israels 70th birthday. The event includes a dinner at $18 for adults and $10 for children 12 Talmud classes: On Mondays and most Wednesdays, explore ancient legal tradition with Dr. Priscilla Nathanson The class is open to all levels of knowledge. The Monday class is held after minyan from 10 11:15 a.m. and the WednesLox & Learn: Led by Rabbi David Weizman, explore the weekly Torah portion every Thursday following minyan. Breakfast begins at 9:45 a.m. and the study session at 10 a.m. Haftarot study: This study will be led by Johanna Bromberg in the synagogue library on Wednesday, April 11 at 10 a.m. Meditation series: Rabbi Danielle Upbin, leads a course that combines guided meditameets next on Thursday, April 5 at 2 p.m. These sessions offer the Jewish tools to nurture selfgrowth and spiritual awareness. New participants Yoga Shacharit: Open to all levels, join in a blend of gentle yoga and chant from the Jewish tradition on Saturday, April 7 at 9:15 a.m. Wear comfortable clothes for movement. Bring your own mat and towel.Chabad of ClearwaterTorah and tea: Rebbetzin Miriam Hodakov leads a Torah and Tea exclusively for women on Wednesdays at 11:15 a.m. There is no charge to attend. RSVP to MiriamHodakov@ gmail.com or (727) 265-2770. Pray, eat, watch video: On Sundays from 9-10 a.m., feed your body and soul with a bagel short video presentation. There is no charge, and everyone is welcome. Study groups: Probe the ideas and issues presented in each weeks Torah portion on Mondays from 7-8 p.m. The Torah studies classes offer timely lessons for living. The class is free. Tanya class: A new weekly Tanya class, A Tale of Two Souls, meets on Saturdays from 10:15-11 a.m. The Tanya offers a roadmap for emotional healthy living. The in-depth study will ask such questions as What is a soul? What is our purpose here on earth? The class is free.Temple Beth-El St. PetersburgBreaking bread: The congregation will celebrate the end of Passover with pizza and beer on Friday, April 6 at 6 p.m. Seniors lunch and learn: The SAGE (Seniors for Arts, Growth and Education) group will meet on Monday, April 16 at 11 a.m. in the all-purpose room at the temple to hear Cantor Pamela Siskin discuss Israel Then and Now. Following lunch, Beth Gelman, the executive director at the Florida Holocaust Museum in St. Petersburg, will be the guest presenter. There is no cost for the program. Lunch will be $8 or you can bring your own. RSVP to Cantor Siskin at prsiskin@gmail.com. Daystar lunch making: Help feed the homeless and families at the Daystar Life Center by gathering in the social hall on Sunday, April 8 at 9:30 a.m. to schmooze and make sandwiches for folks at Daystar. Sisterhood to meet: The Sisterhood will hold a general membership meeting on Sunday, April 15 from 10 a.m. to noon in the temple All members and prospective members are welcome. RSVP by April 1 to Pamela Katz-Alston at pamelannkatz27@gmail.com or call (727) 502-7108. Mitzvah Day: The congregation will be distributing toiletries and clothing to the needy, as well as performing other acts of kindness on Mitzvah Day on Sunday, May 11 from 8:30 a.m. to 1 p.m. The event will begin with a light breakfast and an orientation before teams are formed and sent out into the community to do good deeds that include beach or nature park cleanup, painting rooms, light housekeeping, making food and a sing-a-long for the elderly. For more information, call (727) 347-6136.Chabad of St. PetersburgMoshiach meal: Join in a traditional Moshiach meal on the last day of Passover, Saturday, April 7 at 7:15 p.m. The Haftorah reading for this day describes the promised future era of universal peace and divine perfection. A meal will be served, complete with salmon, salads, wine and matzah. All are welcome and there is no charge. RSVP is appreciated at info@ChabadSP.com. Womens Book Club: Chaya Korf leads a roundtable discussion every Tuesday from 10:3011:30 a.m., about the book for this year, Towards a Meaningful Life, by Simon Jacobson. The group PAGE 6 JEWISH PRESS of PINELLAS COUNTY MARCH 23 APRIL 5, 2018 Congregations PINELLAS COUNTYReformTemple AHAVAT SHALOM 1575 Curlew Rd., Temple BETH CHAI DAVID Temple BETH-EL Congregation BNAI EMMUNAH 57 Read Temple BNAI ISRAEL ConservativeCongregation BETH SHALOM Congregation BETH SHOLOM Congregation BNAI ISRAEL OrthodoxCHABAD of CLEARWATER CHABAD JEWISH CENTER OF GREATER ST P ETERSBURG CHABAD of PINELLAS COUNTY Road, Palm Harbor, 34683 PASCO COUNTY ConservativeBETH TEFILLAH/JCC OF WEST PASCO OrthodoxCHABAD OF WEST P ASCO HERNANDO COUNTY Reform Temple BETH DAVID Religious Directory Shabbat and Passover Candle Lighting Times Take a peek into any preschool classroom and you will likely see a crowd of darling little children all gathered in one corner of the room where the dress-ups are kept. Hats, scarves, suits, skirts, shoes, costume jewelry, boas and other articles of clothing, help children to engage in playacting and to escape into a world of make-believe in which they can become anything or anyone they want to be. A recent article in Very Well Family magazine tells us that by using their imagination, preschoolers can gain vocabulary skills ing, especially when it happens with other children, encourages taking turns, cooperation, and socialization. Taking on another persona and dramatically telling a story, brings the event to life in a way we might not otherwise experience through a simple reading. Play acting should not solely be the domain of preschoolers. At this time of year, Jews throughout the world join with family, friends and strangers around tables laden with mostly edible props. Using the Haggadah as our script, we engage in a form of role play by re-telling the story of our miraculous redemption from servitude in Egypt. And although most of us will Give props to the Passover storyBy RABBI LEAH M. HERZ Director of Spriritual Care, Menorah Manor Rabbinically Speaking Rabbinically Speaking Rabbinically Speaking Rabbinically Speaking Rabbinically Speaking Rabbinically Speaking not be costumed during our Seders, we will nevertheless do our best to convey the story of the Exodus according to the commandment that we see ourselves in the narrative. This is not a tale about something that happened thousands of years ago to someone else in a place far, far away. This is a story that we are to experience as if happening in real time, right here and right now. Our props take on mixed with wine becomes mortar for bricks. Salt water morphs into the bitter tears of slavery. We sing. We dip. We lean. We praise. We talk about the types of slavery that still exist in our world today. We do all that we can to transform ourselves into the lead acPeople. We can all learn a lot from preschoolers. This year may we too let down our guard and allow our imaginations to run free so that we might experience yeztiat mitzrayim, the coming out of Egypt, in a deeper and more meaningful way. Wishing all a Siesen Pesach. The Rabbinically Speaking column is provided as a public service by the Jewish Press in cooperation with the Pinellas County Board of Rabbis. Columns are assigned on a rotating basis by the board. The views expressed in the column are those of the rabbi and do not necessarily of the Jewish Press or the Board of Rabbis. others; those considering adopting Judaism as their faith, and those who are already Jewish who wish to enhance their knowledge of Judaism. New students are welcome anytime. Cost is $100 per person or couple, for non-members; free for temple members. Misfortune and grief: An adult education class is underway on Tuesdays at 11 a.m. with Rabbi Klein focusing on misfortune and grief. He will attempt to provide tools from the social sciences and from our Jewish tradition that will help us cope with our own suffering and help us assist others in dealing with theirs. He will use, as primary text the book, Option B, by Facebook CEO Sheryl Sandburg. 8811 to join.Cong. Bnai Emmunah Tarpon SpringsIntroduction to Judaism: This class is offered at the synagogue on Mondays and Tuesdays from 5-7 p.m. weekly through May, except on April 30. Learn about Israel: A class titled Israels Milestones and Their Meanings will be offered on Mondays April 2, 9, 16, 23 and May 7 and 14 from 7-9 p.m. This class is in celebration of the 70th Anniversary of the state of Israel and is a course designed by the Shalom Hartman Institute. The course will include video lectures from the Hartman faculty. JCC of West Pasco Port RicheyUnderstanding prayer: A class focused on the history, meaning, and relevance of Shabbat service prayers meets on Wednesdays through May at 7 p.m. Knowledge of Hebrew is not required. There is no fee, and all are welcome.Chabad of West PascoClasses with the rabbi: Rabbi Yossi Eber will teach classes on Mondays at 7 p.m. The classes alternate between Torah study and the Tanya. Pray, eat, watch video: On Sundays from 9-10 a.m., feed your body and soul with a bagel and will be a short video presentation. There is no charge, and everyone is welcome. Tanya class: A new weekly Tanya class, A Tale of Two Souls, meets on Saturdays from 10:15-11 a.m. The Tanya offers a roadmap for emotional healthy living. The in-depth study will ask such questions as What is a soul? What is our purpose here on earth? The class is free.Temple Beth David Spring HillArt show: Temple Beth David will host its third annual Nature Coast Art Show on Saturday and Sunday, April 7-8. There will be an artists reception from 4:30-8 p.m. Saturday with an evening of refreshments and conversations with the artists. Previewing and pur chasing available art can be done at this time. The show and sale will continue on Sunday from 10 a.m. to 5 p.m. Admission is free to the public. There will be food, a silent auction, and original artworks by emerging and professional artists from Floridas Nature Coast. For more information, call Barb at (352) 686-7034. Torah study: Rabbi Paul Schreiber conducts Torah study classes on Mondays at 10:30 a.m. and 7 p.m. Free for members and $5 per class for non-members. Judaism class: A free Judaism conversion class will be held on Saturdays at 1 p.m., conducted by Rabbi Schreiber. Talmud for beginners: This class, already under way, is held every Wednesday at 8 p.m., except for the third Wednesday of the month. It is free for members and $5 per class for non-members.Chabad of Spring HillTorah studies: The com munity is invited to attend Torah study classes on Wednesdays from noon to 1 p.m. The classes, taught by Rabbi Chaim Lipszyc, are not sequential, so drop-ins are welcome. Bagesl will be served. The For more information, call Ro Kerschner at (352) 746-6258. Some of you who met me probably heard me speaking about my familys heritage my mother was born in Germany and my dad was born in Israel but grew up in Morocco. Given that background, my brothers and I grew up with two different cultures in our household. A lot of the traditions I was accustomed to were so entwined in my life that only when I grew up did I realize which tradition belonged to which background. But one thing I can tell you for sure when it came to food, the Moroccan side was always clearly present and if I had to compare it with the east European food, it almost always won (with the exception of Cremeschnittean amazing European cake). Both of my grandmothers were cooks in their profession at one point of their lives and later on my mom joined the tradition, becoming the kibbutz main chef. Needless to say, I was never the skinniest girl in class. Both my mom and her mother (who was born in Europe), at some point of their lives, decided to adopt the rich, colorful and tasty Moroccan cuisine into their kitchen because once you taste it, all you want to do is just keep on eating it. I can go on and on about the food event which happens every year, when Moroccan food culture stands out all across Israel the Mimouna. Mimouna is the name for a big feast that is celebrated at the end of Passover and the beginning of spring. After eight days of observing Passover, most Jews happily put down their matzot and reach for the leavened breads, pasta, cookies, and other foods that had been forbidden during the holiday. At that time, the Moroccan-Israelis will begin the celebration of Mimouna. They, too, will begin to eat hametz (leavened foods), but unlike others, they make a party out of it with food, music, dancing, and sometimes even costumes. The Mimouna started as a tradition in Morocco that came to symbolize good relations with the Muslim neighbors. Jewish families in Morocco gave or sold their leavened foods to their Muslim neighbors for the duration of the holiday and when Passover ended, they invited their neighbors into their homes for a feast. Moroccan Jews who immigrated to Israel in the states early days brought the celebration with them, and it has grown ever since. Today Mimouna is a national holiday in Israel with big family or public outdoor parties that begin at sundown and often last into the next day. Frequently, politicians attend the celebrations, and it is a badge of honor to have a member tion. One of the traditions that Israelis kept for the celebration of the Mimouna is open doors. People are free to come and join the feast without any invitation or any announcement in advance. Some people make a night out of it going from one Mimouna to the other throughout the whole night. Now, once you go inside a house that is hosting a Mimouna the one thing you go running to is the food table. It is a beautiful sight a colorful table covered with traditional and less traditional jams, marzipans, nut cookies, candied fruit and stuffed dates. The most recognized food and cooked in a greased frying pan until it is yellowbrown in color. It is usually eaten warm and prepared on site, normally spread with butter, honey, syrup, jam, walnut, pistachios or dried fruits. Besides that, there will be dablas (North African fried ribbons of rolled dough in Many traditional Mimouna tables are set with symbols wheat for a full harvest; a hamsa, or hand-shaped amulet, to ward off evil; and honey and dates for sweetness. As a child, I remember loving Pesach just because I knew that by the end of it, my parents are taking my brothers and me for an hour-long drive only to get to my grandparents house and celebrate the Mimouna. The house was always full with people, the table was always colorful and the food was always sweet and comforting. JEWISH PRESS of PINELLAS COUNTY MARCH 23 APRIL 5, 2018 Congregations Mor About Israel Mor About IsraelYAEL MORIsrael Shlicha [Emissary] Yael, in costume, with her aunt, Karin Rauch, from Germany at a Mimouna celebration.Celebrating the end of Passover in an oh so sweet way in Israel Yael Mors yearlong visit to the community is sponsored by the Jewish Federation of Pinellas and Pasco Counties. She can be reached at (727) 530-3223 or by email at yael@jewishpinellas.org www.sartorialinc.com (727) 290-6783 Affordable Made-to-Measure Dresswear Linen & Silk World Class Shirts, Jeans, Tees, Performance Wear 400 Beach Drive NE Unit 169 Downtown St. Petersburg will share strategies for not only discovering where your true meaning lies, but also in actually making it a part of your daily life. Coffee, fruit and homemade pastries will be served at these free sessions. Walkins are welcome. RSVP to Chaya@ ChabadSP.com. Lunch and Learn: Women are invited to share an hour of camaraderie, inspiration and delicious lunch at a Lunch and Learn session at the Chabad Jewish Center on Tuesday, April 17 at noon. There is no charge for the event. RSVPs are appreciated but not necessary. To RSVP: Chaya@ChabadSP.com or call (727) 344-4900.Cong. Bnai Israel St. PetersburgPassover BBQ: Leave the Passover cooking to someone else for the night at CBIs annual Passover BBQ hosted by the Mitzvah Mens Club on Wednesday, April 4 at 6p.m. On the menu are hot dogs, hamburgers and chicken or grilled vegetables. Sides include garden salad, potatoes, all the matzoh you can eat, assorted condiments, dessert and beverages. Cost is $20 per adult, $10 per child. RSVP to Alan Gross at (727) 327-0100 by Friday, March 30. Walk-in availability will be limited. Celebrating Israel with food: Join in a Kabbalat Shabbat service on Friday, April 20 at 6 p.m. followed by Got Shabbat? Israeli-style dinner for those with reservations. Then come back Saturday, April 21 at 9 a.m. for Shabbat services, followed by an Israelistyle kiddush. Cost for the dinner is $20 per person and children eat free. RSVP by Friday, April 13 to Pam Askin at (727) 381.4900 or Beatles-themed Shabbat: Come dressed. in your grooviest clothes and celebrate as the Kabbalat Shabbat service is set to Beatles melodies on Friday, April 27 at 6:30 p.m. Arrive at 5:30 p.m. for a Beat Bugs style jam session for families with young children with Maureen prior to the service. Come together after the service for a casual Shabbat dinner and build a Yellow Submarine sandwich (vegan & gluten-free options available). Cost for dinner is $5 per person or $10 per family; RSVP by Friday, April 20 to Liz Sembler at lizsembler@ aol.com or (727) 381-4900. Dinner is open to all ages and hosted by the CBI Jewbilees (the synagogues Baby Boomers social group). Talmud Made Easy: On Tuesdays, March 20 at 5 p.m., Steve Wein will lead a study of Talmudic text and selected commentaries. All materials will be provided. The class involves textual analysis, lively discussion and is open to all. The class is free; no previous knowledge is needed. 381-4900 or info@cbistpete.org for details.Temple Ahavat Shalom Palm HarborPoker tourney: The Brotherhood will sponsor the 2nd Annual Texas Hold em Poker Tournament on Saturday, April 7 at 7 p.m. The evening will include food, drinks and prizes for the winners. Buyin is $40. For more information or to RSVP, contact Scott Alalof at (904) 994-3820 or visit http:// ahavatshalom.org/navigation-3/ brotherhood. Toddler time: There will be an hour of activities incorporating music, literacy, Judaics and snacks for children ages 1-4 on Sunday, April 8 at 10 a.m. Tots are invited to bring a special adult with them. Lunch n learn: Congregant Susan Segal teaches a Torah study class on Thursdays from noon to 1:15 p.m. Bring a lunch, and of course, opinions. No prior knowledge or attendance is required. The class will use the bookThe Torah: A Womans Commentary. Judaism basics: An Introduction to Judaism class is offered on Sundays at 10:30 a.m. This class, taught by Rabbi Gary Klein is appropriate for nonJewish spouses and significant TRAVEL AGENCY, INC.4300 Central Avenue, St. PetersburgDUGGARMemberAmerican Society of Travel AgentsEugenia K. Duggar, CTCDirector of OperationsTerry W. CoxAssistant Manager Hy Pvr r rnrs rv! PAGE 12 JEWISH PRESS of PINELLAS COUNTY MARCH 23 APRIL 5, 2018 Organizations The Jewish Burial Society of Pinellas County, Inc. would like to recognize and send a heartfelt thank you to the Federations, families, Synagogues and Temples that helped fund our Hurricane Irma cleanup. Over the past 6 months, your commitment to Chapel Hill Memorial Park has helped us come a long way with repairing, replacing and replanting. Were still accepting additional Thank You! Thank You! www.chapelhillmemprk.orgThe Jewish Burial Society of Pinellas County Inc. dba Chapel Hill Memorial Park Diane Cohen Congregation Bnai Israel Dr. Mark and Judi Gordon David and Pati Gross Anita Helfand Beverly Helie-Pollack Sam and Sandy Janofsky Jewish Federation of North America Jewish Federation of Pinellas and Pasco Counties, FL Jewish United Fund/Jewish Federation of Metropolitan Chicago Anne and Robin LaMaire Rabbi Jacob and Joanne Luski Howard Miller Doug and Joan Negretti Dr. Marc and Laurie Reiskind David and Teddi Robbins Maurice A. Rothman and Thelma P. Rothman Family Foundation Sharlene Sakol Dr. Harold and Joyce Seder Greg and Liz Sembler Mel and Betty Sembler Shumaker, Loop, & Kendrick, LLP Dr. Mike and Sandy Slomka Tampa JCCs and Federation Inc. Temple Beth-El Jim and Vicki Trombly UJA-Federation of New York Ralph Wescott The Jewish Burial Society of Pinellas County Inc. dba Chapel Hill Memorial Park your commitment to Chapel Hill Memorial Park has helped us come a long way with repairing, replacing and replanting. Were still accepting additional SUSHI TUESDAY 6 pm close Reservations recommended DRINK SPECIALS 4 pm 6 pm $5 House Wine $5 Single Shot well drinks or martinis Floral Design Studio 6700 Central Ave., St. Petersburg local and worldwide delivery Weddings Events Bar/Bat Mitzvahs Redman Steele 727.343.1020 RedmanSteeleFlorist.net HadassahMah jongg fundraiser: The Lylah Pinellas Chapter of Hadassah will have a fundraising mah jongg event on Wednesday, April 25 from 10 a.m. to 3 p.m. at Countryside Country Club, 3001 Countryside Blvd., Clearwater. The event will include a salad buffet luncheon and the cost is $25 per person. To make arrangements for payment and to RSVP contact Lynne Brubaker at lynnebru@aol.com or (727) 782-3086. If you can, bring your card and your game.JWIFor the kids: Jewish Women International North Pinellas will enjoy brunch as they hold a fun draiser for the Childrens Home on Sunday, April 22 at 10:30 a.m. with a Table for Two demonstra tion by Chef Warren Caterson The event will be at East Lake Woodlands Country Club, with valet parking. The cost is $38 per person. For more information, con tact Amy Richman at richman. amy52@gmail.com or (727) 5430108. Meet Rabbi Dani: On Tuesday, April 24 at 7 p.m., learn how a girl from Great Neck, NY, becomes a rabbi of today. JWI will welcome Rabbi Danielle Upbin associate rabbi and prayer leader at Congregation Beth Shalom in Clearwater, as guest speaker. Ordained from Jewish Theo logical Seminary, she holds a BA in political science, and is cur rently president of the Pinellas County Board of Rabbis. She is an educator and trainer of all things Jewish, a professionally trained singer and yoga instructor. She is married to Rabbi David Weizman, senior rabbi at Beth Shalom, and is mother of four children. All are welcome. For more information, contact Lynn Brodsky (727) 787-6154Genealogical SocietyThe Jewish Genealogical Society of Tampa Bay will meet on Sunday April 8 at 2 p.m. at Gulf Coast Jewish Family & Community Services, 14041 Icot Blvd., Clearwater, for a hands-on working session for individual research using the Internet and library resources of the organization. Experienced society mentors will be on hand to provide guidance and assistance. Free access to Ancestry.com and to MyHeritage. com (Premium), will be offered on several computers and available for use. Attendees are asked to bring their own research materials and information and their own laptop computer if they have one. A presession social with refreshments and library access begins at 1:30 p.m. For information about the organization or directions to the meeting, call Bruce Hadburg at (727) 796-7981.Young Adults#Gather offers a mix of social and interactive activities designed to help young adults connect. It is open to young adults of all faiths and backgrounds. For more information or to RSVP for any #Gather events, visit: www.bry anglazerfamilyjcc.com/gather or contact Lisa Robbins at lisa.rob bins@jewishtampa.com or (813) 769-4723. Flavor tripping: The #Gather group will meet Monday, April 9 from 6:30-8:30 p.m. at 81 Bay Brewing Company, 4465 W. Gandy Blvd, Tampa, to experience the miracle berry from West Africa that turns tart and savory foods denly tastes like lemonade. Cheese tastes like frosting. Vinegar tastes like apple juice. The cost is $5 for members and of beer will be available for $5. Spin class: Join in a high-energy spin class with other #Gather members at the Glazer JCC on Monday, April 23 at 6:30 p.m. This is free for members and $7 for guests and includes access to the entire JCC for the day. Pedal through hill climbs, sprints and interval training with motivational music to help push you through the challenge. Cool down with a smoothie by the pool together. Reserve your bike today. Job-LinksMonday Morning Links: Free sessions of Monday Morning Links are offered at the Jack Roth Center for Career Development at TampaBay-Job-Links, 4100 W. Kennedy Blvd., Suite 206, Tampa from 9:30 11 a.m. On April 2 the topic is Whats Your Nonverbal Communication Saying? On April 9 the topic is The 7 Habits of Highly Effective Job Seekers and on April 16 the topic is How to Work the Room at a Networking Event or Job Fair. Monday Morning Links is supported by the Vinik Family Foundation. Job-search aids: The next Success workshop will be Thurs day, April 5 from 9:30 a.m. to 12:30 p.m. The topic is Steps to Negotiate a Job Offer and on April 12 it is Mastering Change and Transition. The workshops are free for TampaBay Job-Links full program participants and $15 for guests. Reservations required for all programs. T To RSVP, call (813) 344-0200, email RSVP@TBJL.org. Support groupsAlzheimers caregiver group: Menorah Manor offers a support group meeting in the Sam son Nursing Center at Menorah Manor, 255 59th St. N., St. Peters month from 3:30-5 p.m. For more information, call Gwen Kaldenberg at (727) 302-3750. JEWISH PRESS of PINELLAS COUNTY PAGE 13 MARCH 23 APRIL 5, 2018 www.MenorahManor.org 240 59th Street North, St. Petersburg FL 33710 AL#10306 Personalized Support Respite Stays Available Large Private Apartments Life Enriching Programs SPRING SPECIAL!$2,500 Community Entrance Fee Waived AND $500 OFF Monthly Rental for 1st 6 MonthsOFFER EXPIRES APRIL 30, 2018Call 727.302.3800 to schedule a tour and ask about a free 2 night trial! Street North, St. Petersburg FL 33710 This coupon is not valid in combination with any other coupon, special, promotional offer or team member discount. Coupon only valid at the Whole Foods Market Carrollwood, Clearwater and Tampa locations. No duplications, copies, facsimiles or mobile coupons will be accepted. This coupon may not be used towards the purchase of a Whole Foods Market Gift Card. No cash value. Please, only one coupon per household per day. Coupon good for $10 off total one-time purchase of $50 or more. Coupon valid through 4/8/2018. Mon. Fri. 6:00 am Noon Sat. & Sun. 6:00 am 1:00 pmBoiled & Baked the traditional way at the same location for over 30 years!1871 Gulf To Bay Blvd. (Clearwater)~ Next to Clearwater High School ~(727) 446-7631 JP A feature-length documentary, GI Jews: Jewish Americans in World War II, will air nationwide on PBS stations on Wednesday, April 11 at 10 p.m. 550,000 Jewish Americans who served their country in all branches of the military during World War II. Filmmaker Lisa Ades (American Experience: Miss America) brings the struggles of these brave men more personal war to liberate loved ones in Europe. After years of battle, these pioneering servicemen and women emerged transformed: more profoundly American, more deeply Jewish, and determined to GI Jews premieres April 11 on PBS (check local listings) in honor of Holocaust Remembrance Day following day on pbs.org and PBS apps. GI Jews features more than 25 original interviews with veterans who speak candidly about the impact served in the Army; Henry Kissinger, a refugee from Nazi Germany who was drafted into the Army; Carl Reiner, the son of Jewish immigrants, who traveled vices Entertainment Unit; the late Bea Cohen, who the 1st infantry division and was the cantor at a Jewish service in Aachen, Germany, broadcast by NBC in 1944. While Jewish Americans relationship to the Holowell-known saga of World War II to life in a new way who produced and directed the documentary. In addition to battling the enemy, Jewish Americans fought a second, more private battle against antiSemitism within the ranks. They sought to observe their religion far from home while enduring slurs and even violence from their fellow servicemen. These Jewish Americans were often felt forced to prove their courage and patriotism. Fighting together they forged deep friendships across religious lines and learned to set aside their differences for the greater good. In the aftermath of the Holocaust, Americas Jewish community was now the largest in the world, and by the end of World War II, the United States had begun to embrace its Jewish citizens as true Americans. With their new responsibility as international leaders, many Jews became passionate about postwar culture Film on PBS documents service of Jews during World War II From the documentary GI Jews, which will air in honor of Holocaust Remembrance Day. JEWISH PRESS of PINELLAS COUNTY PAGE 15 MARCH 23 APRIL 5, 2018 727.789.2000 Obituaries 12905 Wild Acres Rd. Largo, FL 33773 Serving the Pinellas County Jewish Community since 1968The Jewish Burial Society of Pinellas County Inc. dba Chapel Hill Memorial Park is a 501 (c) (3) non-prot corporation licensed by the State of Florida 6366 Central Avenue St. Petersburg Fl 33707DAVI D C. GROSSFUNERAL HOMES727.381.4911Reform Conservative OrthodoxTHE JEWISH FUNERAL HOME OF PINELLAS COUNTY830 N. Belcher Road Clearwater, Fl 33765 Michael, Mandi, David, Pati and Steven Gross Happy Passover! Freedom Deliverance Reflection Freedom Deliverance Reflection EDWARD CLARK, 94, of Gulfport died March 7. Born in Boston, he was a veteran of the United States Army and was stationed in the Philippines as a store manager for Zayre Department Store. Survivors include his wife of 70 years Marilyn; son and daughter-in-law, Larry Clark and Ellen Moss; daughter and son-in-law, Diane and Russell Cantwell; two sisters, Rhoda Silverman and Helen Irving; two grandsons and a great-granddaughter. (David C. Gross Funeral Homes, St. Petersburg Chapel) HAROLD HAFTEL, 92, of Tarpon Springs, died March 13. Born in Brooklyn, his family moved to Flemington, NJ where they had a chicken farm. He studied agriculture in Pennsylvania and worked for the Department of Agriculture. In the 1960s he was sent to Dunedin to be the inspector of HP Hood & Tarpon Springs to build a chicken farm for his father and brought his parents to Florida. The 40 acres eventually became an orange grove. He was one of Shalom in Clearwater, when services took place in a storefront, and he rethe years he also supported Temple kibbutz and discovered the Weizmann Institute of Science, where he learned about drip irrigation being developed in Israel and used the technology in his own orange grove. He became a maInstitute and sat on its board. Active within the community, he was a memthe Jewish Federation. He also volunteered for the Rotary Club and picking up donated eyeglasses at local libraries. He was one of the recipients of the the Jewish and general community. (David C. Gross Funeral Homes, Clearwater Chapel) EARL WALLACE SKIP MOORE JR. Clearwater, died March 16. He was born and raised in Parsons and Elkins, WV, and lived many years in Baltimore and Virginia Beach moving to Clearwater 10 years ago. He served in the United States Navy. Later he became a licensed electrician in Maryland. He worked in corporate sales for many years and then became a business owner with multiple retail locations throughout Virginia. In recent years, he held the position of Fleet Captain for the Clearwater Yacht Club. Survivors include his wife Sharon Nusman Foster; son Earl Chip Moore III (Lisa Guzzardo); step-sons, Samuel Foster (Leigh Ferguson), Richard Yarrow (Debra), Brian Yarrow (Robin); two grandchildren and six step-grandchildren. The family suggests memorials to Suncoast Hospice. (David C. Gross Funeral Homes, Clearwater Chapel) MACK MITCHELL SHUMAN of St. Petersburg, died March 13. KNOWother staples of the traditional Seder, including the Seder plate and charoset. Their maror (bitter herbs) is a mixture of lemon peel, bitter lettuce and an assortment of other herbs. Israeli Jews observe only one Passover Seder, unlike everywhere else where traditionally two Seders are held, one on Known as yom tov sheni shel galuyot literally the second festival day of the Diaspora the practice was begun 2,000 years ago when Jews were informed of the start of a new lunar month only after it salem. Because Jewish communities outside of Israel were often delayed in learning the news, they consequently couldnt be sure precisely which day festivals were meant to be observed. As a result, the practice of observing two Seder days was instituted just to be sure. Some progressive Jews have adopted the practice of including an orange on the Seder plate as a symbol of inclusion of gays, lesbians and other groups marginalized in the Jewish community. The story goes that the practice was instituted by the feminist scholar Susannah Heschel after she was told that a woman belongs on the synagogue bimah, or prayer podium, like an orange belongs on a Seder plate. But according to Heschel, that story is false. In that apocryphal version, she said, a womans words are attributed to a man, men is erased. Isnt that precisely whats happened over the centuries to womens ideas? In truth, the idea occured after a visit to a university where some students had been putting bread crusts on the Seder plate as a symbol of protest against the exclusion of women, gays and lesbians. Heschel liked the idea but instead proposed an alternative that did not bring hametz onto the seder table. The orange was to be consumed and the seeds spit out representing the rejection of homophobia. The 16th American president was shot at Fords Theatre on a Friday, April 14, 1865, which coincided with the fourth night of Passover. The next morning, Jews who wouldnt normally have attended services on the holiday were so moved by Lincolns passing they made their way to synagogues, where the normally celebratory Passover services were instead marked by acts of mourning and the singing of Yom Kippur hymns. American Jews were so affected by the presidents death that Congregation Shearith Israel in New York recited the Kaddish usually said only for Jews on Lincolns behalf. For many Seder participants, the highken piece of matzah that the Seder leader hides and the children search for; the pera small reward. Most scholars believe the word for dessert. Others say it refers to a kind of post-meal revelry common among thing eaten at the Seder. Donald Trumps new national security adviser John Bolton is a hawk who has said military strikes may be inevitable as a means of preventing Iran from acquiring a nuclear weapon. Naming Bolton suggests that Trump is ready to pull out of the 2015 Iran nuclear deal by May 12, the deadline to waive sanctions. The agreement trades sanctions relief for a rollback of Irans nuclear program. Bolton is a staunch opponent of the deal, as is Mike Pompeo, the CIA chief Trump just nominated to replace Rex Tillerson as secretary of state. Bolton has said on multiple occasions that striking Iran to stop it from going nuclear may be inevitable. I dont make any disguise of the idea that ultimately it may take an Israeli strike against Irans nuclear program to stop it, he told the conservative Washington Free Beacon in August. Tillerson and outgoing national security adviser H.R. McMaster both dont like the deal but counseled against pulling out of it because Iran is complying with its narrow strictures, and leaving would remove whatever leverage the United States has with its allies to pressure Iran outside the deals tis, the defense secretary, as the opposes leaving the deal. Bolton has close relations with the pro-Israel community stemming from his success in 1991 in getting the United Nations to rescind its Zionism is racism resolution. Bolton at the time was the assistant secretary of state for international organization affairs under nominated Bolton as ambassador to the United Nations in 2005 and named him acting ambassador. Bolton never cleared the Senate nominating process, in part because of his hawkishness on because subordinates at the State Department emerged to describe him as an abusive boss. Bolton under the younger Bush had been the undersecretary of state for arms control and international security affairs. Pro-Israel groups, including the American Israel Public Affairs Committee, at the time broke with their protocol against endorsing a nominee and lobbied for Boltons Bolton was forced to step down from the U.N. post. McMaster got along well with his Israeli counterparts, but angered some on the right wing of the pro-Israel community because of reports that he blocked Trumps recognition of Jerusalem as Israels capital. Trump ultimately recognized Jerusalem in December and announced plans to open a temporary embassy there in May. Morton Klein, who heads the hawkish Zionist Organization of America, called Bolton a spectacular choice to lead the NSC. He understands the Arab Islamic war against Israel and the West, Klein tweeted. Bolton is a patriot and an ardent clear thinking Iran Deal. Rep. Adam Schiff, D-CA, the ranking member of the House Intelligence Committee, was alarmed by Boltons appointment. Its hard to escape the disquieting conclusion that the mass exodus of the adults from this Administration is putting our nations security at risk, he tweeted. Ambassador Boltons hawkish and conspiratorial thinking will only make matters dangerously worse. In February, Bolton wrote an op-ed in The Wall Street Journal urging the United States to use force to solve the nuclear standoff with North Korea.New Trump advisor is Iran hawk, close to pro-Israel groupsHe was born in Baltimore. Survivors daughter and son-in-law Meredith and Paul Leonhirth; stepdaughter, Tanya Tostado; and four grandchildren. The family suggests memorials to Temple Hospice. 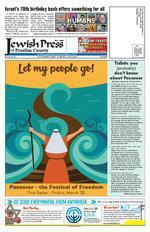 JEWISH PRESS of PINELLAS COUNTY PAGE 17 MARCH 23 APRIL 5, 2018 Weekly Kosher Shabbat Dinners Traditional Jewish holiday Celebrations Private Van Service 250 58th Street North, St. Petersburg, FL 33710 Ad sponsored by Benjamin Tower FoundationStudio and one bedroom apartments are available through rental programs that offer affordable housing to seniors living on a limited income. Daily Activities 24 Hour Front Desk Coverage Reserved Parking Activities, Activities, Activities Weekly Kosher Shabbat Dinners Traditional Jewish holiday Celebrations Private Van Service 250 58th Street North, St. Petersburg, FL 33710 Ad sponsored by Benjamin Tower FoundationStudio and one bedroom apartments are available through rental programs that offer affordable housing to seniors living on a limited income. Daily Activities 24 Hour Front Desk Coverage Reserved Parking Activities, Activities, Activities Wishing you a Happy Passover! Wishing you a Happy Passover! Wishing you a Happy Passover! Wishing you a Wishing you a Happy Passover! Wishing you a Happy Passover! Wishing you a Humans of Tel Aviv, that will be on display throughout the day. My goal is to give people around the world an inside look into the rich and remarkably diverse lives of Tel Avivians and showcase Israeli multiculturalism and its vibrant civil society, Kaganovits said. Kaganovits photos reach as many as 500,000 people per month including many in the Arab world through his blog, which he began in 2012. Accompanying each photo is a brief story about the person he has captured with his camera. What I love most about this project is that I can reach people in a way that Im not forcing my ideas upon others, but rather simply taking a photo, telling a story, and letting it speak for itself, the photographer said. You can see religious Orthodox Jews, Muslims and Christians alongside gays, lesbians, and transsexuals; you can see refugees sophisticated people from Rothschild Boulevard, Kaganovits explained in an interview with Israel21c.org. A variety of other speakers also will be on hand to remind folks of the importance of the Jewish state and what the nation faces as it continues to grow and bloom. Rabbi Ed Rosenthal of Hillels of the Florida Suncoast will speak about the challenges Jewish students face on college campuses around the Tampa Bay area when speakers and student groups voice positions against Israel. Two authors will discuss their Jewish-themed books. Roslyn Franken of Seminole will talk about her book, Meant To Be: A True Story of Might, Miracles and Triumph of the Human Spirit. It is a love story about how her mom, who survived Nazi concentration camps, and dad, who was in a Japanese prisoner of war camp, met and fell in love. Author Lynda Lippman-Lockhart of St. Petersburg will also speak about her book, The Laundry Room, which is a tale of Israeli resistance in 1946, two years before the state of Israel was created. Both authors will be available for sales and signings of their books. Another speaker, Eric Lynn of St. Petersburg played a large role during the Obama administration in getting approval and funding for Israels Iron Dome rocket defense system. Lynn will discuss his work on the project, which is credited with saving hundreds of civilian lives. For musical entertainment, Rabbi Danielle Upbin of Congregation Beth Shalom of Clearwater will lead a sing-a-long, accompanied on guitar by Blake Lenett, a congregant at Beth Shalom. Food will be complimentary with traditional Israeli and Jewish food, provided by Jo-Els Delicatessen and Marketplace of St. Petersburg. For the kids there will be a bounce house, an archeological dig, face painting, balloon art and Walsingham Rd.SEMINOLE BLVD. 113th St. / Ridge Rd.ULMERTON RD.Starkey Rd.Heritage VillageWalsingham ParkTAMPA Walsingham Rd. E W N SLARGOPINEWOOD CULTURAL PARK Botanical Gardens LARGO MALL BEACHES 12211 Walsingham Rd. Largo, FL 33778More information about the Israel Independence Day celebration can be found on the Federations website, www.jewishpinellas.org or by calling (727) 530-3223.ISRAEL Photographer Erez Kaganovits, creator of the Humans of Tel Aviv exhibit, will be at the Pinellas Israel Independence Day event on Sunday, April 15. the opportunity to make Israeli For all ages, there will be Krav Maga self defense demonstrations and Israeli dancing. A committee of individuals representing synagogues and agencies has worked to create a day of fun and celebration for everyone, said Maxine Kaufman, the Federations director of arts, culture, and education. This is a very special year for Israel, and were bringing together the entire community in recognition of this big event. The venue will offer both indoor and outdoor space, some of it under tents, for the festivals activities, so folks can get out of the heat if needed. The celebration is being sponsored by the Florida Arts and Culture Division.